2010 NFL Predictions & Betting Odds - New Era Starting in Seattle: Can a new Era in Seattle make the Seahawks worth considering for your 2010 NFL predcitions? With 50-1 NFL odds to win the Super Bowl in 2010, Vegas odds makers are predicting a rebuilding for the Seahawks and most fans in Seattle would agree. A new era is dawning for Seattle with the hiring of ex-USC coach Pete Carroll and, while improvement from a 5-win 2009 NFL picks season might be a year away, change is certain to come in 2010. 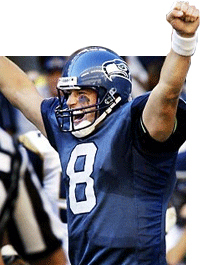 Long-time quarterback Matt Hasselbeck will still run the show in the 2010 NFL predictions schedule for Seattle but, at 35, his time is quickly coming to an end. The Seahawks picked-up Charlie Whitehurst and no one would be surprised if the change at this position happens sooner than later. Truth be told, though, it won’t matter who is under center if the Seahawks don’t develop a #1 receiver. For all the money spent on free agent wide-outs in recent years, they have yet to find a true go-to guy. T.J. Houshmandzadeh seemed to be “that guy” but he is better served in the secondary role he excelled at in Cincinnati. Untested Deon Butler is the starter at the other position and Carroll likes what he has seen so far in camp. The running game could help if third-year man Justin Forsett emerges this 2010 NFL predictions, as many predict, while Julius Jones provides depth. The offensive line has yet to be crystallized, but new faces will abound for the 2010 NFL picks season including first round draft choice Russell Okung. Big changes for the Seattle Seahawks in the 2010 NFL predictions season are also on defense where the Seahawks will use a 3-4 defensive alignment with a hybrid linebacker/DE. That player, named an “elephant” will be DE Chris Clemons. Linebackers Lofa Tatupu and Leroy Hill still lead the defense and Marcus Trufant is solid in the secondary. How much will the Seahawks improve nthis NFL predictions season? Vegas oddsN makers are predicting between 7 & 9 NFL picks wins but, with all the uncertainty, the smart money would be on the seven or under in this rebuilding NFL picks season. You can bet on the Seahawks to make the 2011 Super Bowl picks matchup at Bodog.com and take advantage of their NEW BONUSES! The Vegas style online sportsbook is now taking NFL predictions on everything NFL, including your selection on who will win the 2011 Super Bowl. Whether you plan to Bet the Seattle Seahawks or anyone else Bodog.com has got your game.